Spacious 3 bedroom condo with wood floors throughout and travertine tile in baths = perfect beach home with no carpet to deal with anywhere! 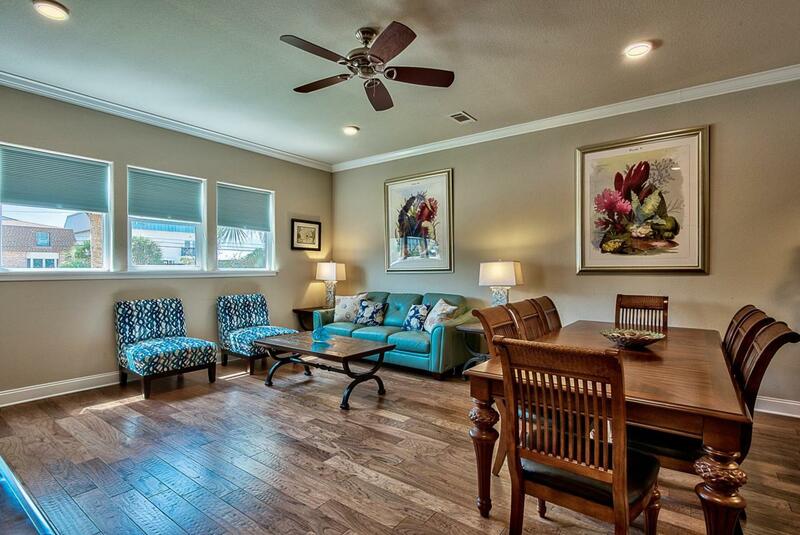 Beautifully furnished and decorated for easy transition to a vacation rental or for you and your family to enjoy. 10' ceilings and crown molding in living area, granite counter tops, custom cabinets and stainless steel appliances in kitchen. En suite master bath is complete with double sink vanity, soaking tub and walk-in shower with frameless glass door. Guest bath also features granite vanity. Directly across the street is the beach via two public beach accesses , or hop in your golf cart for a short ride to shopping, dining and entertainment on Scenic 98. An on-site check-in office adds to Alerio's value and security.Fenced and gated, with a heated pool, hot tub, splash pad for kids and outdoor grilling area.